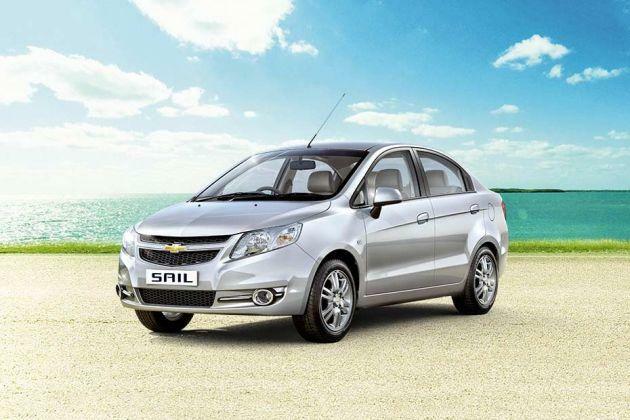 Chevrolet Sail 1.3 LT ABS is a top end diesel variant in its model lineup that is available with a few modified interior and exterior aspects. It is incorporated with a 1.3-litre diesel power plant that has the ability to displace 1248cc. This mill is mated with a 5-speed manual transmission gear box that distributes engine power to its front wheels. It can produce a maximum power of 22.1 Kmpl and can accelerate from 0 to 100 Kmph in 11.9 seconds approximately. The exteriors receives a few updates like a revamped bumper, hawk wing styled headlamps, a tweaked radiator grille and has chrome highlighted front fog lamps. On the other hand, it has chrome highlighted interiors in a classy dual tone color scheme. It has luxurious leatherette upholstered seats, while the steering wheel is also wrapped with leather. Other new aspects include backlit power window switches and an instrument cluster with icy blue illumination. In terms of safety, it has a dual horn, child safety locks, engine immobilizer, side impact beams and many other such aspects that ensures maximum security. This sedan is currently offered in six exciting body paint options for the customers to choose from. The list includes Caviar Black, Switch Blade Silver, Super Red metallic finish, Sandrift Grey, Summit White as well as Linen Beige. It comes with 3-years or 1,00,000 Kilometers standard warranty that can be further increased at an additional cost. Its major competitors in the market include Toyota Etios, Ford Classic, Tata Zest and a few others in this segment. This trim has an aerodynamic body structure that is equipped with some attractive features. The front fascia has an aggressive radiator grille that is treated with chrome and embossed with the company's logo in its center. It has a newly designed hawk wing styled headlight cluster that is equipped with high intensity headlamps. Below this grille is a body colored bumper that includes an air intake section and a couple of fog lamps with chrome surround. There are a couple of intermittent wipers fitted to its windscreen, while the expressive lines on bonnet further adds to its appearance. The side profile is designed with body colored door handles and external mirrors. Its wheel arches are fitted with a stylish set of 6-spoke, 14 inch alloy wheels that are covered with tubeless radial tyres of size 175/70 R14. It also has a full size spare wheel affixed in the boot compartment along with tools required for changing a flat tyre. Its rear end includes a body colored bumper, tail lamp cluster and a boot lid with company's emblem embossed on it. Other features include a large windscreen that is fitted with a centrally located high mount stop lamp. It is built with an overall length, width and height of 4249mm, 1690mm and 1503mm respectively. It has a large wheelbase of 2465mm, while the minimum ground clearance comes to 168mm. The roomy cabin is designed elegantly with black and beige color scheme. It provides comfortable seating for five people besides offering them with enough leg room. The dashboard houses a glove box compartment and a stylish center console that is equipped with an audio unit. It also includes a three spoke steering wheel and an instrument cluster that has icy blue illumination. The seats are well cushioned and covered with a new leatherette upholstery. Other aspects in the cabin include front seat back pockets, cup holders in front console, front door map pockets, 12V power outlet, sun visors and a few others. This sedan has a spacious boot compartment of 370 litres, which can be further increased by folding its rear seat. The automaker has powered this Chevrolet Sail 1.3 LT ABS trim with a turbocharged diesel engine that has the ability to displace 1248cc. It has four cylinders, 16 valves and is based on a dual overhead cam shaft valve configuration. This 1.3-litre mill has a common rail direct injection system that helps in producing a mileage of 22.1 Kmpl, when the vehicle is driven on bigger roads. This motor is coupled with a five speed manual transmission gear box that transmits torque output to its front wheels. The maximum power produced by this mill is 74bhp at 4000 rpm in combination with a peak torque output of 190Nm at 1750rpm, which is quite good. This sedan can attain a top speed in the range of 150 to 155 Kmph and takes around 11.9 seconds to break the speed mark of 100 Kmph. The suspension system is very strong and formidable. It is further accompanied by passive twin tube gas filled shock absorbers. Its front axle is fitted with McPherson strut, while rear one is assembled with a twin axle type of mechanism. On the other hand, the front wheels are fitted with a set of disc brakes, while the rear wheels get drum brakes. This braking mechanism is further augmented by ABS along with electronic brake force distribution. It has a rack and pinion based steering wheel, which is quite responsive. This tilt adjustable steering wheel supports a minimum turning radius of 5.15 meters. Being the top end variant, this Chevrolet Sail 1.3 LT ABS trim is integrated with a number of sophisticated features, which gives the occupants a pleasurable driving experience. It has a multifunctional steering wheel that is mounted with audio and call control buttons. The advanced instrument panel comes with ice blue illumination and houses a digital tachometer, door ajar and driver seat belt notifications, low fuel warning light, digital clock and an electronic tripmeter. The advanced 2-DIN music system supports Aux-in port, USB interface, CD/MP3 player, radio with AM/FM tuner along with four speakers and a remote control. It also has been incorporated with Bluetooth connectivity, which further helps in music streaming, mobile hands free with making or receiving a call, caller number identification, automatic reconnection. This hatchback has a safe cage body structure, which has crumple zones and side impact beams that enhances the protection of the passengers inside. It has 3-point ELR seat belts for front passenger along with pretensioner and load limiter. It also has driver seat belt reminder notification on instrument panel. Apart from these, this variant is equipped with dual airbags, ABS along with EBD, a centrally mounted fuel tank, speed sensitive auto door locks, dual horn, key-in reminder, rear doors with child safety lock , a high mounted stop lamp, rear defogger, fog lamps and an engine immobilizer for preventing the vehicle from theft. All these features put together makes it one of the safest in its own segment. 1. Fuel economy is quite satisfying. 2. Impressive safety and comfort features.